It’s called a Mecca for a reason. Standing outside of Purcell Coffee in Golden BC I peer upwards above my steaming thermos. Big, steep, white and endless are the peaks that surround this strategically placed town. Nearly tripping over my own feet as I perform a slow shuffling 360 while drooling over the sea of mountains and wonder, how do I choose where to ski tour first? Access, objectives and current conditions define what's possible and safely accomplishable in a day. It’s a good thing that nature filters what’s in and out on a daily basis. As an indecisive mountain lover, I need some guidance on where to go first because my hungry eyes often can’t select just one mountain for the shredding. After a few years of exploration via ski touring in the Golden BC area and some local insight, I’ve created a starting ground for your next ski touring objective. While the explanations below are thorough, they are not enough to be considered a trip report or guide book, there purpose to offer a sense of inspiration to start your own research. On that note, before you start planning read the section below. Getting started for the very first time or for the first time in a “little while”, it’s important to learn, review and refresh your backcountry skills and knowledge. The “Safety In The Backcountry” blog was made to get your backcountry brain spinning in the right gear. Be sure to give it a read and brush up before you venture to any of the areas mentioned in this blog. Avalanche Courses: Avalanche Safety Solutions, Trigger Point, Kicking Horse Mountain Resort, Zacs Tracs, Yamnuska and Hangfire. 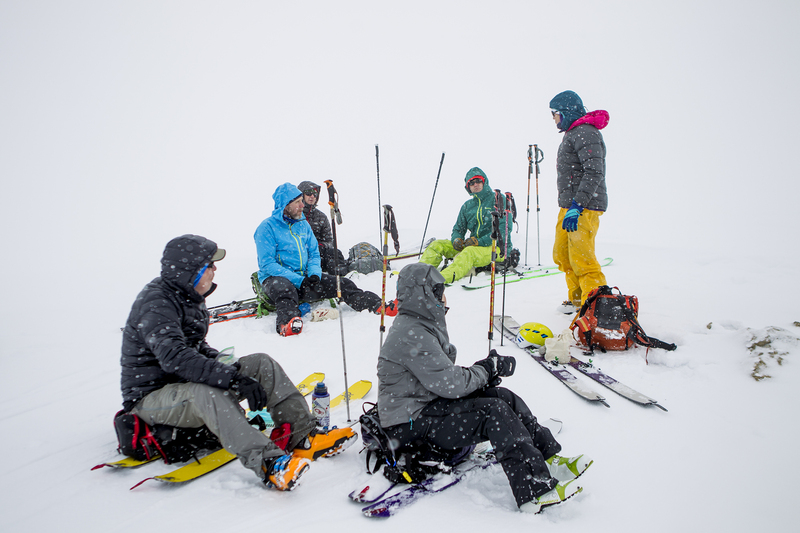 Guided Outings: High Country Ski Guides, Jonny Simms, Canadian Powder Adventure, and Adrenalin Descents. All guides listed are accredited ACMG guides. Avalanche Canada has lots of course review and interactive scenarios to learn from and brush up on as well. The closest cremedelacreme to town is accessed via snowmobile. Don’t have one? Golden Snowmobile Rentals can help with that. Check out one of the staging areas below and you’ll see friendly regularly groomed snowmobile trails thanks to the Golden Snowmobile Club. The smooth roads will deliver you to a variety of treeline and alpine basins that are paradise for ski tourers. Standing atop any of the peaks in these nearby area you’ll see town beneath your toes and a whole lot of skiing in between you and town. A great perspective, a variety of terrain and close to home base - does it get better? After scooping up your rental at GSR grab a bite at Bluebird Cafe and don’t forget to purchase a tasty bagged lunch - YUM. Now onto the predetermined staging area and back to GSR before 6pm to return that pretty snowpony you borrowed. The Purcell Mountains to the east of Golden are visible from town. The pronounced jagged peaks that pierce the sky and undoubtedly capture your gaze are known as the Dogtooth Range. And get this, they are even more fun than they look. Rudi’s Ridge South is a great spot for intermediate skiers and riders to get comfortable in the area. The rest of the terrain in the Dogtooth Range is fairly complex and committing, it’s a great place to hire a certified ACMG guide to show you the lay of the land so you can learn how to navigate this technical playground. Read a first my first-hand account how epic the Dogtooth Rang is in the “Ski Touring in Golden BC’s Backyard” blog. You could easily be entertained for days out here and if conditions turn not so favourable head back in bounds and play it safe in the fun terrain offered at Kicking Horse Mountain Resort. First things first, you’ll need to have a winter permit sorted before you slap skins on in this zone. You can obtain information about this process here, or by stopping in at the Rogers Pass Discovery Centre. 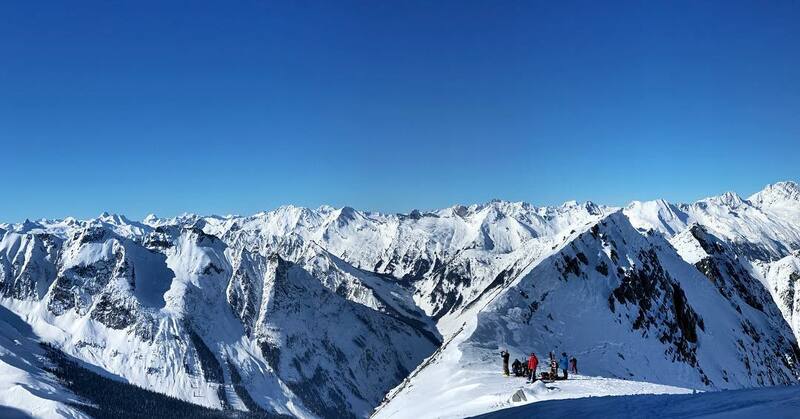 With skiable objectives that offer vertical upwards of 2000m a day it’s an understatement to call this place massive. It’s impressively large and in charge in both the vertical and terrain departments. Start by scouring the “Ski Touring in Rogers Pass” book and then go with an objective that matches your ability in both physicality and terrain understanding for the current conditions. Rogers pass is on many bucket lists and for good reason, the lines here feel remote, big and you quickly unplug for society - ah! That said, you are remote, like really remote, be sure to care a communication device that works out here like a Spot or Inreach. Due east of Golden lies a place that’s no secret in the summer but is a ski tourers delight in the winter. 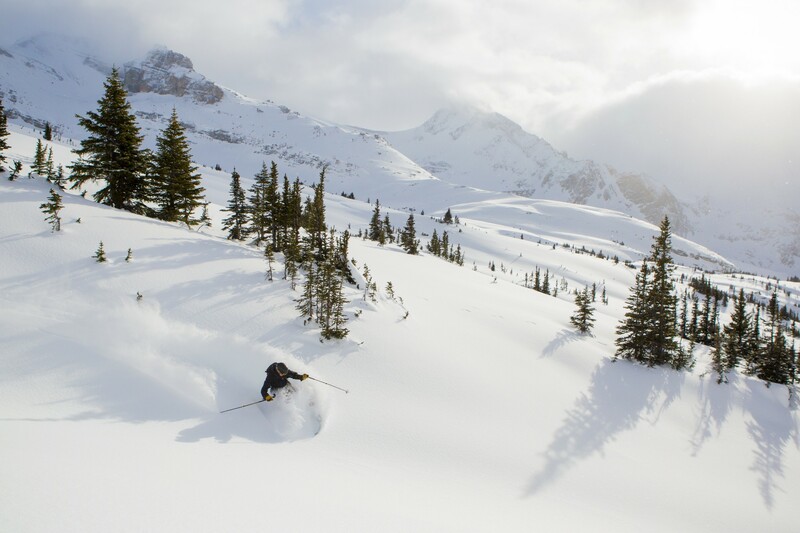 Yoho National Park is chalked full of ski objectives and it’s only a 30 min drive from Golden. Stage your day from Emerald Lake Lodge or from the Yoho Valley Road (closed in winter but you can park nearby). Both access points will put you in the midst of some of the most scenic and iconic peaks of Western Canada. These mountains demand respect with large consequential avalanche paths and a history to prove it, a solid safe route plan is a must. There are a few Alpine Club of Canada huts you can access in Yoho for multi-day traverses, overnight trips or ski touring destinations. A unique option that this region is gaining fame for, everything you need to know to reserve a hut is available on the ACC website. Whether you’re two meters outside the rope at Kicking Horse Mountain Resort or deep in the Blaeberry Valley, you’re in the backcountry meaning it’s all equally wild and untamed. Having the right knowledge, tools available and know how to use them combined with proper pre-trip research is a must. When it doubt hire a guide to teach you how to do all of these things with confidence - a great investment. What to get more information about Golden, B.C., sing up for our newsletter. A lover of all things outdoors, Abby Cooper is a splitboarder, hiker, adventurer, year-round snow seeker, photographer, writer, living life one adventure to the next. The heli and split boarding industry is an incredible place to work. It’s called a Mecca for a reason. Standing outside of Purcell Coffee in Golden BC I peer upwards above my steaming thermos. It’s mid-April and the lifts just stopped spinning.